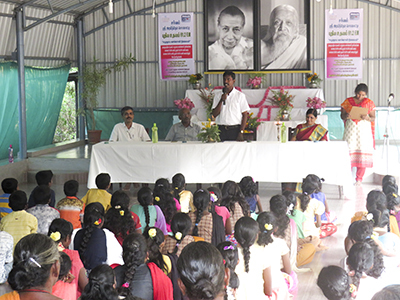 Sri Aurobindo Rural & Village Action & Movement (SARVAM) has been working in the field of integral rural development for the last nearly 15 years and currently operates in 18 villages, including Poothurai. On November 24, 2014, the much-awaited SARVAM Community FM Radio Station in Tamil ‘Pudiya Udayam’ (New Dawn) was launched at the Poothurai village (Villupuram District, Tamil Nadu), near Puducherry. Since its launch, Pudiya Udayam 91.2 FM radio station has been a highlight in the lives of the SARVAM villages for information, education and entertainment. On November 24, 2018, the ‘Pudiya Udayam’ celebrated its fourth anniversary. 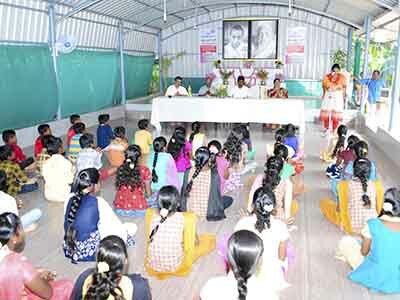 To commemorate the occasion, a small celebratory function was organized at the SATYAM centre of SARVAM. Many partner organizations have played an important role in the growth and progress at SARVAM villages, by periodically conducting financial literacy and agricultural training programmes at different locations for the rural economic and financial development, and two such organizations are Indian Bank and Krishi Vigyan Kendra, supporting us through their local rural self-employment training institutes Indian Bank Self Employment Training Institute (INDSETI) and Perunthalaivar Kamaraj Krishi Vigyan Kendra (PKKVK). Therefore, Mr. P. Aguilane, Director—INDSETI and Mr R. Murugan, Herbal Curator—PKKVK, were invited as chief guests of the function, along with most of the radio programme presenters, many resource persons (both external and in-house), people from the villages and SARVAM coordinators. For the last 4 years, the community radio station has been ceaselessly producing and broadcasting programmes to meet the increasing information needs of the rural populace, besides providing spreading awareness among communities so that they can be involved in their own development process. Pudiya Udayam’s primary objective is to transmit programmes that pertain to major issues that the people face in their day-to-day lives. In addition, many inspirational and individuals are regularly interviewed and successful models introduced to the listeners to help motivate them for their own life and livelihood. 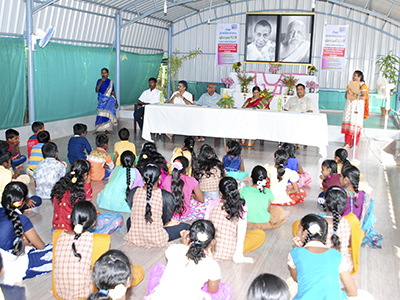 Apart from producing programmes on devotional and patriotic skits and songs; health, sanitation and nutrition-based segments; psychological and spiritual guidance sessions; weather reports, etc., age and gender-specific programmes for children, youth, women, labourers and the aged are being broadcast. According to Mr Senthil Kumar, Director—SARVAM, through the radio the people of the village are able to participate in the highly interactive programmes by recording their own songs, stories and experiences, making it a very contributory endeavour. He also added that the radio station is reaching out to more than 50,000 people in 30 villages in both Puducherry and Tamil Nadu, and broadcasts can be heard up to a 10 km area.